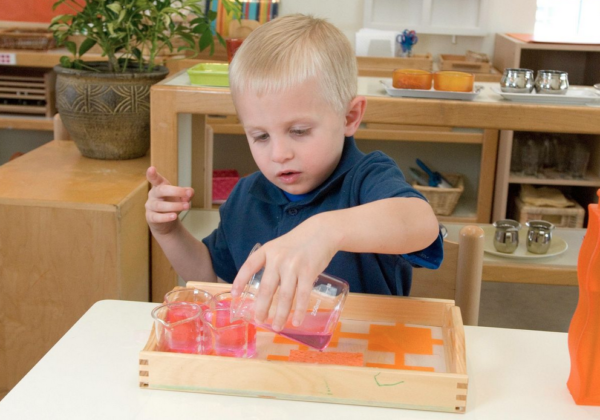 Competence, independence, willingness to embrace the challenges of change are, quite possibly, the most important building blocks of the Montessori Method. We provide opportunities to help our children learn these vital skills at the most basic level: Practical Life. Beginning with lessons on using a mat or rug intended for the youngest child and extending all the way to learning how to run a small business, the Practical Life Scope and Sequence was designed to be a comprehensive resource that provides essential information to Montessori guides for classrooms ranging in age from Toddler through Upper Elementary. The Practical Life Scope and Sequence provides students with many opportunities to feel independence and competence, and develop their fine and gross motor skills, as they engage in real world activities such as washing tables, folding clothes, and preparing food. With these goals in mind, the sequence of lessons and materials is important. The Practical Life category is divided into sub-categories that contain lessons sequenced in the order in which they would be introduced for most children in many Montessori classrooms. The Practical Life Scope and Sequence is displayed in the following “online magazine” format. Lessons/Materials are listed on the spreadsheet, sequenced the same as they are in the Montessori Compass online record keeping software. Each lesson/material may contain multiple elements, which are tagged to the appropriate cycle year(s). In some cases, parent-friendly descriptions will be listed, designed to help parents gain greater insight into the Montessori classroom.